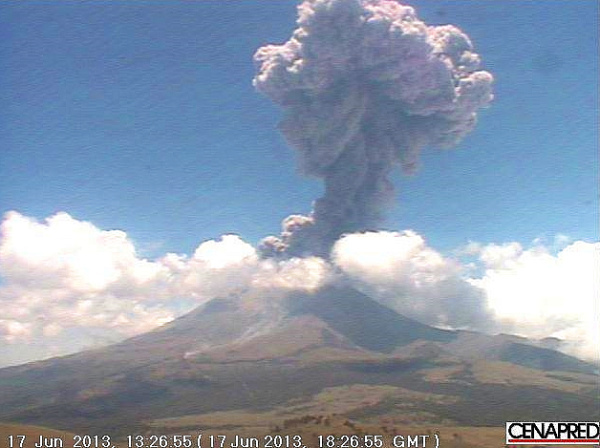 Popocatepetl Volcano (“Don Goyo” to the people living in its shadow) continues to erupt. On 4 July, several airlines, including American Airlines, US Airways, Delta Airlines and Alaska Airlines suspended operations to and from Mexico City for several hours, resulting in numerous cancelled flights. Access is restricted within a radius of 12 km from the volcano’s crater. Permanence in this area is not allowed. The road between Santiago Xalitzintla (Puebla) and San Pedro Nexapa (Mexico State), including Paso de Cortes, is open only to authorized traffic. Civil Protection authorities maintain preventive procedures, according to operative plans. People are advised to follow guidelines provided by official information bulletins. There are only two higher levels (both described as “Alarm” rather than “Alert”): Red Phase 1 and Red Phase 2. 8 May – Ash rose 3000 m above the volcano before falling on several municipalities in the states of Puebla and Tlaxcala. Residents were advised to sweep it up without using any water to prevent the ash from sticking together and blocking drains. Mexico City’s international airport was closed to flights for a short time. 14 May – Eruptions continued, accompanied by an increase in seismic activity. The Alert Level was raised to Yellow Phase 3 for several days, with evacuation plans about to be implemented. A dome of lava, about 350 m across and 50 m thick, had formed in the crater, prior to being destroyed in an eruption which formed a 3000 m high ash cloud and sent incandescent fragments (“volcanic bombs”) up to 1000 m from the crater. The volcano’s activity subsided within days and the alert level was reduced to Yellow Phase 2. 17 June – A month later, another explosion (see photos) sent ash more than 4000 m into the air, and threw volcanic bombs up to 2000 m from the crater, starting a series of minor wild fires. Winds blowing towards the northwest carried ash towards the south-eastern section of Mexico City. A week later (24 June), minor amounts of ash fell in eight municipalities in the state of Mexico: Amecameca, Tlalmanalco, Temamatla, Cocotitlán, Ozumba, Atlautla, Ecatzingo and Chalco. The local authorities reported no damage, but reminded residents, among other things, to avoid wearing contact lenses if at all possible. The next day (25 June), ash fell on some southern and eastern parts of Mexico City. Three international flights scheduled to land in Mexico City airport were diverted to Querétaro airport. The typical sequence of activity is shown in the photos. First, pressure from molten rock underground (magma) leads to the formation of a dome of lava in the summit crater (photo below). These domes eventually either collapse or are destroyed by explosions (photos below) that lessen the pressure beneath the surface. Following the explosion (shown by the satellite image below), a new dome begins to form, and the cycle of eruptive activity continues. Geophysicists from the National University (UNAM) who monitor the volcano and analyze its gaseous emissions say that between 1994 and 2008 the volcano emitted 30 megatons (30 million tons) of gases and that it looks set to continue erupting for several years. Popocatepetl is one of the top five volcanoes in the world for emissions of sulfur dioxide. The volcano has added between 6000 and 8000 tons/day to the atmosphere in recent months. Lead researcher Hugo Delgado Granados has been quoted in press reports as saying that the continued gaseous emissions are good news, since the constant releases of pressure should preclude a more explosive eruption. This YouTube compilation of webcam videos of the volcano provides a time-condensed view of the eruption of 17 June 2013. The 30-second video represents a period of 20-30 minutes, during which the volcano exploded into action, sending a cloud of gases, ash and volcanic fragments high into the air. 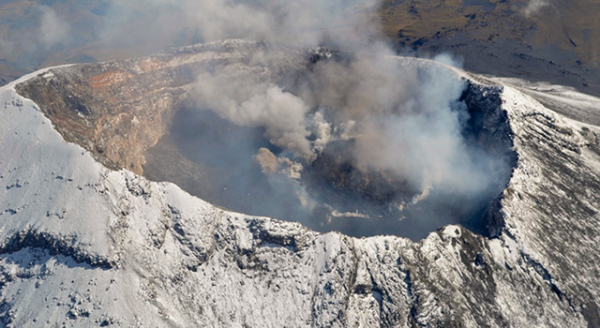 The picture from NASA is actually of the Sarychev Volcano, not Popo! Thanks for the pertinent correction. That image and reference has now been removed from the post. We appreciate you taking the time to point out our error and hope you continue to read (and correct when necessary) geo-mexico.com posts! I love reading your blog, especially being a former Peace Corps Volunteer/GIS Specialist in Tlaxcala. A few of my friends posted that picture a few months ago on their facebook walls and it looked very impressive, but the outlying cloud cover looked a little off. After a little sleuthing, it turns out it’s a volcano in Russia!